A hard money loan is simply a short-term loan secured by real estate. They are funded by private investors or funds as opposed to conventional loans funded by banks or credit unions. 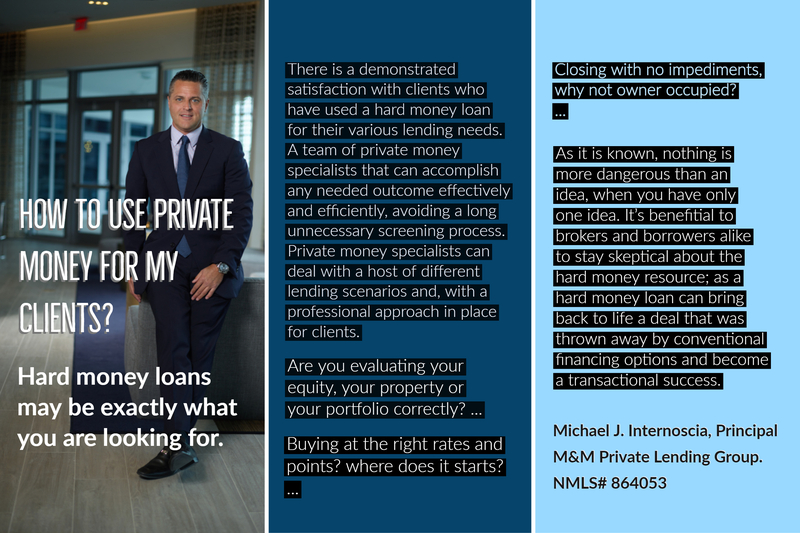 Many hard money lenders have to get approval from investors on every loan, but M&M Private Lending has 10’s of millions in dedicated funds to ensure the terms quoted are the terms closed on. The length of the loans are usually one to three years. The loans are generally interest only with a balloon payment at the end of the term. The amount the hard money lenders can lend to the borrower is primarily based on the value of the subject property. The property may be one the borrower already owns for cash out/refinance or a new property for acquisition financing. Hard money lenders are primarily concerned with the property’s value rather than the borrower’s credit. Many hard money lenders still perform a credit check for minimum credit, but at M&M Private Lending, we do not check the credit worthiness. Borrowers who cannot obtain conventional financing due to a recent foreclosure or short sale can still use a hard money loan if they have sufficient equity in the property that is being used as collateral. When the banks say “No,” we like to save the day with a strong “Yes”.